Taste of Nepal: 2012 - Happy Bijaya Dashami - विजया दशमीकेा शुभकामना! 2012 - Happy Bijaya Dashami - विजया दशमीकेा शुभकामना! I would like to wish the "Taste of Nepal Blog" readers a very Happy Bijaya Dashami. May happiness smile on your world and in your heart! Thank you for stopping by and experiencing the culinary and cultural journey to Nepal. विजयादशमी (२०६९) को सुखद उपलक्ष्यमा हजुर तथा सम्पूर्ण परीवार हरुमा शान्ति, समृद्धि, सुस्वास्थ्यका लागि हार्दिक मंगलमय शुभकामना अर्पण गर्दछु! Religious Offerings placed in front of the statue of Kaalo Bhairab, Hanuman Dhoka, Kathmandu (a part of National Heritage of Nepal). 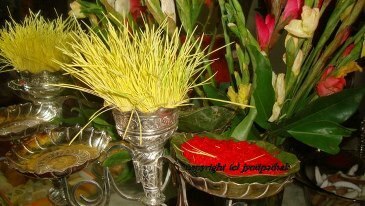 The streets are lined with Sayapatri (marigold flowers) and Makhamali or Supariful (globe amaranth) flowers. At the entrance of Makhan Pashupatinath Temple (saano Pashupati), vendors are selling religious offerings such as incense sticks, dhoop batti, butter lamps, marigold flowers, coconuts, holy waters and other numerous offerings. Sight and sounds of Dashain time - picture captured from the Maru Sattal (Kasthamandap). Worshiping at the Taleju Bhabani Temple, hanuman Dhoka in Kathmandu. It is opened to general public only one day on the ninth day of Vijaya Dashami Festival. Tikaa and Jamaraä - On the 10th day of Bijaya Dashami, Acheeta ko Tikaa" and "jamaraa" is received from the senior member of the family with blessings. Beautifully carved windows from the "Nau-Talle Durbar" in Basantpur Durbar square area, Kathmandu, Nepal. All information on the Taste of Nepal blog are restricted use under copyright law. You may not re-use words, stories, photographs, or other posted material without the explicit written consent and proper credit to Jyoti Pathak. If you would like to use any materials here, please contact me. Rudraksha beads have been used since ages for various benefits.The powers radiated by Karya Siddha mala is due to multiple effects from the different face / mukhi rudraksha bead combinations aligned in the mala. Thank you for visiting the Taste of Nepal blog and taking time to comment. It is a site dedicated to the exploration of flavors, cuisine, culture, and festivals of Nepal. Taste of Nepal blog have no interest in advertising and other promotional materials. I would appreciate if you could keep your comments relevant to the culinary and culture heritage of Nepal. Namaskar, Hello, Welcome! Thank you for visiting the Taste of Nepal blog, a site dedicated to the exploration of flavors, cuisine, culture, and festivals of Nepal. All About Cuisines - Connecting Culture Through Food!